Synthetic peptide within Human Oxytocin-neurophysin 1 aa 1-100. The exact sequence is proprietary. The immunogen is within the oxytocin cleaved unit. Neurophysin 1 specifically binds oxytocin. Oxytocin causes contraction of the smooth muscle of the uterus and of the mammary gland. Oxytocin is a posterior pituitary hormone which is synthesized as an inactive precursor in the hypothalamus along with its carrier protein neurophysin I. Together with neurophysin, it is packaged into neurosecretory vesicles and transported axonally to the nerve endings in the neurohypophysis, where it is either stored or secreted into the bloodstream. Oxytocin contracts smooth muscle during parturition and lactation. It is also involved in cognition, tolerance, adaptation and complex sexual and maternal behaviour, as well as in the regulation of water excretion and cardiovascular functions. ELISA image demonstrating the relationship between the concentration of antibody and optical density readings. ab124771 has not yet been referenced specifically in any publications. Publishing research using ab124771? Please let us know so that we can cite the reference in this datasheet. Is this antibody recognizing processed, active oxytocin, or can it also detect ocytoxin in its pre-processed form? Oxytocin is a peptide of nine amino acids, which this antibody is designed to detect. The characterization of this antibody is based on the peptide and our ELISA data (we have not tested it for any other applications). At this time we can only recommend it for detection of the 9 amino acid peptide, not the 125 amino acid precursor molecule. Thanks for your email. I would be interested in testing these antibodies in sELISA. A couple of things to confirm. Will the discount code be valid for 4 months after becoming active (ie after submission of the Abreview) rather than after being issued? Also when ordering we normally go through your Australian distributer Sapphire BioSciences, will this be the case for this order? Could you also tell me the volume and concentration of these antibody solutions? Thank you for your reply. I am very pleased to hear you would like to accept our offer and test ab78364 with ab124771 in sandwich ELISA. To confirm, the discount code is valid for 4 months, the Abreview needs to be submitted and the order placed for the free of charge antibody before this expiry date. The order can go through our Australian distributor Sapphire Biosciences. I am copying them into this email so they are aware. This code will give you: 1 free primary antibody before the expiration date. To redeem this offer, please submit an Abreview for ab78364 with ab124771in sandwich ELISA. and include this code in the “Additional Comments” section so we know the Abreview is for this promotion. Please remember that submission of the Abreview is sufficient for the discount code to become active. I am sorry the concentration will not be determined as this is sold as ascites fluid. I am sorry the concentration will not be determiend as this is sold as tissue culture supernatant, concentration not determined. Unpurified antibodies, such as those sold as whole antiserum, ascites or tissue culture supernatant will not have a concentration stated on the datasheet. 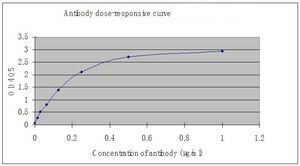 Antibody concentration is usually determined by protein assay, and serum / ascites / tissue culture supernatant will contain a lot of other proteins, which means the antibody quantification would not be accurate. I can confirm that for ascites, concentration of antibody is known to very between 5 - 10 mg/ml. I can confirm that for tissue culture supernatant, concentration of antibody is known to very betwen 1 - 3 mg/ml. I am sorry we are not able to provide an exact concentration on this occasion. Any feedback that you can provide regarding your sELISA experiments will be greatly appreciated, whether positive or negative. If you have any further questions, please do not hesitate to contact us. We look forward to receiving your Abreview and wish you luck with your research. Hello, Im interested in some more information about your testing discount program. I have contacted sale about getting some samples but they suggested that I contact you as I may be eligible for a testing discount. Could you give me some more information about this prospect. To our knowledge, I as sorry to confirm that ab124771 and ab78364 havenot been tested and aer not covered by our 6 month guarantee insandwich ELISA (sELISA). Therefore, I can offer a discount off a future purchase if you buythese antibodiesnow, test them insELISA and submit feedback to us in the form of an Abreview. It doesn’t matter whether the Abreview is positive or negative, we would just really like to receive your feedback. The discount would be to the value of: 1 free primary antibody. 1. Reply to this e-mail to let me know that you would like to proceed and test ab124771 and ab78364 in sELISA. I will then send a discount code. This code must be issued before purchasingab124771 and ab78364 so please wait for my reply before ordering. 2. Purchaseab124771 and ab78364 either by phone, fax, or online (https://www.abcam.com).This initial purchase will be at full price. 3. Test them in sELISA. We are always pleased to obtain feedback about our products and any information is greatly appreciated! Even if ab124771 and ab78364 turns out to be unsuitable for sELISA, you will still receive the discount on your next purchase after your Abreview has been submitted.